Every practising manager knows from experience that whatever actions and decisions he takes, in any particular area of activity, have results which extend well beyond that specific activity. The impact of decisions in some cases affect the whole organization and even external environment. A simple decision to throw out an inefficient, lazy worker can trigger off union activity which can, in extreme situations, even result in strike. The situation may become so hot that the union forces the neighbouring units also to join the strike. Thus when a manager takes a decision he never views its impact in isolation but tries to understand and anticipate its repercussions on the entire organisation and the environment. The manager understands that his organisation is a totality of many, inter-related, inter-dependent parts, put together for achieving the organisational objectives. This in a nutshell is the very essence of the systems concept. A system is defined as a sum total of individuals but inter-related parts (sub-systems), and are put together according to a specific scheme or plan, to achieve the pre-stated objectives. The flows which exist among them, such as flow of information, money, materials, etc. The most important of these is the information flow which we shall discuss in the next section. The structure within which they relate to each other. This structure may be physical, geographic or organisational and shall be dealt with in the section entitled 'organising'. The procedures by which the sub-systems relate to one another. By procedures we mean those planned activities which affect the performance of the entire system. In the context of an organisation, this refers to planning and we shall discuss these under the heading ‘planning' in Management Processes. The feedback and the control process and mechanisms which exist to ensure that the system is moving towards its desired objectives. A system can be biological (human body), physical (machine) or social (commercial organizations, voluntary bodies, etc.). Social systems are man-made systems and the relationships of the sub-systems is the most critical element. Further, since social systems involve human beings, their beliefs, values, attitudes and perceptions have an important bearing on the working of the system. This aspect is dealt in motivating and leading part of subsequent post Management Processes. A system can be closed or open. A closed system is self-sufficient and self-regulatory and has no interaction with the environment in which it exists (see Figure I). The feedback from the output triggers off a control mechanism which then regulates the input to bring back the output to the desired level. An open system is one which interacts with the environment in which it exists. 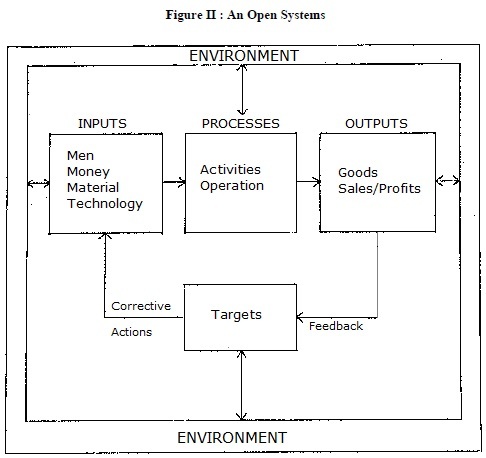 Figure II illustrates an open system. All living, biological and social systems are examples of open systems. An organisation is an open system and its sub-systems are its various divisions and departments. But at the same time, it is a sub-system of the environmental system within which it operates. 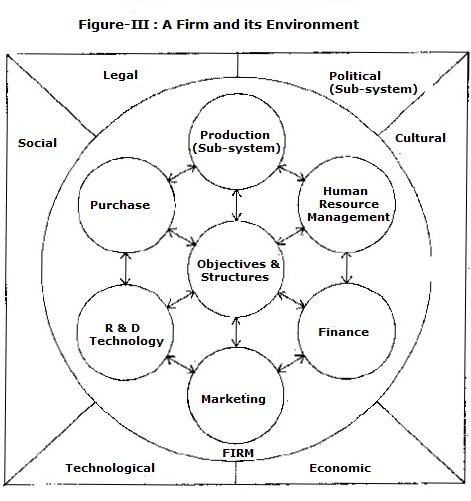 The environment itself consists of social, economic, political and legal sub-systems (see Figure III). 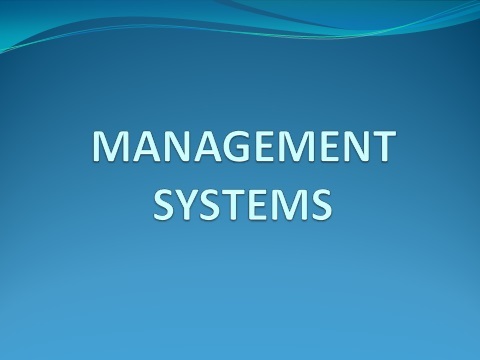 The importance of the systems concept to the manager is that it helps him to identify the critical sub-systems in his organisation and their inter-relationships with each other and the environment. A system is always seeking an equilibrium state, that is, where all the sub-systems are at the optimum level, in tune with and at rest with each other, and the desired output is being achieved. In an open system, this level of equilibrium is never static but is always dynamic. This is because the environment is never static, it is always changing and since the open system is all the time interacting with environment, what may have been an equilibrium level today will not be so tomorrow. It is the concern of the manager to seek this equilibrium level. One of the most important interactions between an organisation and the environment is that of information. A manager who has information about the impending government legislation which will affect his organisation can suitably modify his decision and avoid costly mistakes. Similarly, a manager who is well informed about his employees' activities, expectations, opinions and grievances can take corrective action much before a crisis develops. We now turn our attention to this information flow and see how best it can be organised from the manager's viewpoint. 1. Timely : A market research report, pointing out the unacceptability of milk sold in plastic containers in retail stores, presented to the manager after he has already launched his product in the market is of little use. Information is useful only when it is within the time limits of the decision. 2. Accurate: If the information presented is inaccurate, the manager who takes a decision based on this will invariably end up making a mistake. However, it is not possible to have hundred per cent accurate information. But the way to overcome this is to indicate the expected range of deviation or the level of inaccuracy. Thus the manager acting on the basis of this information knows the risk-he is taking. 3. Relevant: Volumes of reports (however excellent they may be) on the export potential of cashew nut to a manufacturer of sports goods are of no value simply because it is outside his area of interest and activities. The manager himself can make an important contribution in ensuring that the information he receives is relevant to his decision-making. To do so he must provide an answer to the question "What do I need to know"? A manager's requirement of information depends on the level of management at which he is operating. In any organisation there are three broad levels of management i.e., top, middle and operating management. It is the type of decisions made by one level that distinguishes it from the others. The top management's concern is the entire organisation or group of organisations. At the top, the manager needs to have information about changes in the environment which can affect the very survival of his company. The decisions that the top manager makes are oriented towards the future. A decision to diversify into paper manufacturing is not a decision which a printing company will make every now and then, but when it does, it totally changes the future of the company. Top management decisions cannot be taken in a regular, routine manner but only after a great deal of deliberation and consideration and are known as non-programmable decisions. The manager at the middle level is mostly concerned with acquiring and controlling the necessary resources to implement the objectives laid down by the top management. The middle level managers are concerned with decisions which are important both in the present and future context. However, the future horizon of the operating manager's decision is much shorter than that of the top management. The middle level manager's is concerned with managing his own department, or activity rather than the entire organisation. Information needed by the middle manager relates to utilisation of resources and measurement of performance. Managers responsible for production scheduling and customer service who perform specific tasks, within well-defined rules and procedures, are referred to as operating managers. The decisions these managers need to make are of a routine nature and are encountered almost every day. Since the situations are repetitive, it is easy to specify how the decisions are to be made. Such decisions are known as programmable decisions. A store-keeper who orders for a new lot of packing cartons when the stock in the store is down to just the next two days supply is an example of a programmable decision. While designing the MIS, the different types of information required by different managers must be kept in mind. The manager at the top needs more information about the environment. Regarding the internal operations of the company, the top manager is only concerned with the results as reflected in profits, sales volume, turnover, etc. Moreover these results should be presented in a summary rather than detailed format. The middle level manager is interested in finding out why the results were not as per the expected plan, knowing about the deviations of the critical variables and taking corrective action. The operating manager's concern is with details, like the number of hours each machine operated, number of units produced per hour, etc. Most of the internal organisational information is generated at this level but as it moves upward it is reduced to a summary highlighting only the critical performance variables. We have so far defined what we mean by the terms system and management, but have yet to talk about information. Let us understand this with the help of an illustration. A market research team interested in finding out the daily sales volume of Beauty Soap in Nagpur, notes down the number of soap cakes sold from each outlet in the city. The number of soaps sold by M/s Soaps Stores on 18 September, 2006 is a piece of data. In a similar manner, data on sales made by each store in the city is collected. All this data when put together is information. Data by itself does not convey much meaning. However, when all the data is put together we know that 67 outlets in Nagpur account for a sale of 2024 soap cakes. It constitutes a meaningful piece of information. To make it more meaningful, we may further classify the outlets by the type of store (general merchant, super bazar, departmental store, etc. ), geographical location or volume of sale. From this same data we may generate a daily sales report for the marketing department and one for the accounts department showing the outstanding amount against each store. Thus we see that only when data is put together in a meaningful form does it constitute information. Further, the same data can be used for generating multiple reports for use by different individuals and departments. In designing an effective MIS, the manager must understand the nature and flow of information. Information regarding government policy, legislation, competition, etc. is generated in the environment but is collected and used within the organisation. Similarly, the firm or organisation may send out information to the environment in the form of annual reports, company balance sheets, press-releases. Besides this, the company managers and employees are also information carriers. Within an organisation, information may flow from operating level towards top management level (bottom to top) and from top to bottom. Reports, summaries and feedback about impact of decisions flow from bottom to top and decisions, instructions flow from top to bottom. Information also flows sideways from one manager to another at the same managerial level. Figure IV presents the flows of information amongst different management Ievels. Ideally a manager would like to collect information on all possible aspects of a situation before making a decision but that is not always possible due to constraints of time and money. The costs which act as a constraint on MIS are the costs involved in data collection, data processing and data access. Data may be easily available within the organisation but still there is a definite cost involved in collecting it. Suppose you want to gather information about the age and educational qualifications of all the 150 workers in your organisation to determine how many of them would qualify for the proposed scholarship for the under 35 years matriculate workers. You may either depute a man to personally go to each employee and note down the data or you may circulate a small cyclostyled note to the employees asking them to furnish the relevant data. Anyway you decide to do it, a cost is involved (cost in terms of mandays of the person collecting the data or the 150 cyclostyled slips of paper). Having collected all the data, someone will have to sit down and put it in a particular format (process it) so that it constitutes meaningful information which will serve your purpose. Again, an element of cost is involved. Having determined that only 64 workers qualify for the scholarship, the immediate use of the information is over. You can throw away the remaining information or if you think you may offer this scholarship again next year, it would be wiser to store the information. The peon simply puts all the papers in a file and locks it in the filing shelf. Next year when you need the information, somebody will have to search for that particular file and make it available to you (make it accessible). Time is needed to access the information. Thus every step involves time and money. With the advent of computers the tasks of processing and storing data have become easier, and the amount of data that can be processed and stored has increased a thousand fold. Buying, maintaining and operating a computer also involves cost. The manager has to determine whether the costs incurred in collecting, processing and accessing data are commensurate with the improvement it yields to his decision making.